Successful enterprise resource planning (ERP) software implementation depends on having a well-planned strategy that addresses each of these issues. The right ERP system has the potential to make life easier and more productive for you and your employees. It can be daunting to compare features and functionality from a variety of vendors to determine which one will be the best fit for your needs. Agility—can your ERP system adapt to your changing business needs (e.g., more staff, more locations, a new service)? Innovation—does your ERP software foster innovation by making it easier for employees to collaborate? Implementation—how easy is it to deploy the ERP solution you’re considering (and can they launch the new system with minimal disruptions to employees? Industry Expertise—does your ERP vendor have deep knowledge of your industry to inform each release of their products? 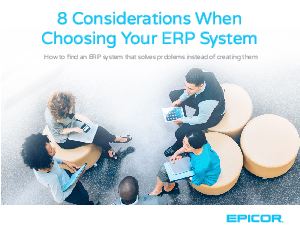 Download the eBook to view the full list of considerations so you can determine selection priorities for your business.